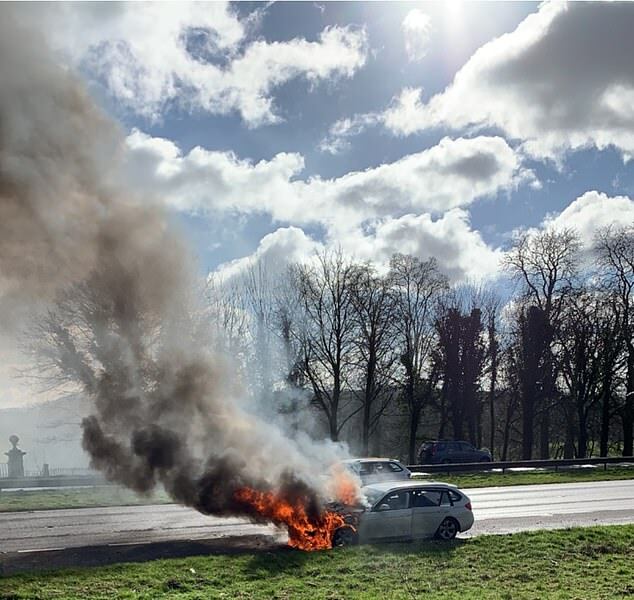 A mother of two has described her desperate scramble to save her children from the back of her BMW after it burst into flames on a dual carriageway. 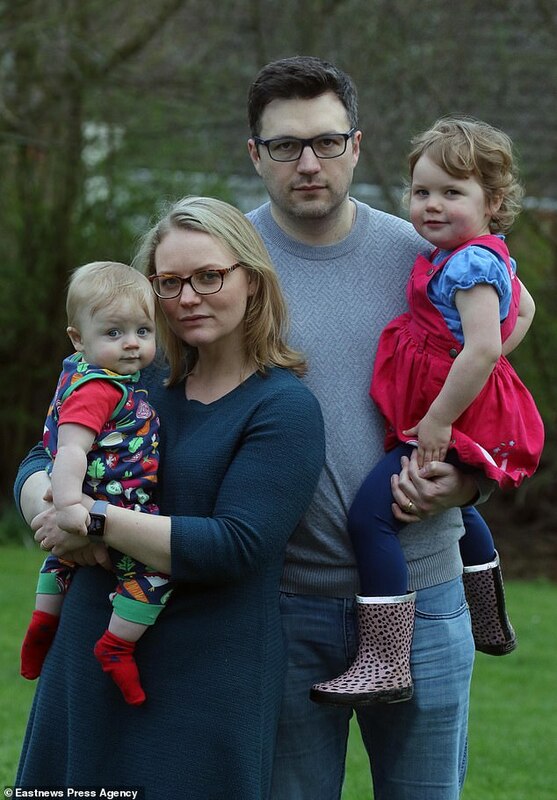 Sara Longley and husband Stuart were driving with nine-month-old Eleanor and three-year-old Adam when their car lost power and smoke poured through the air vents. 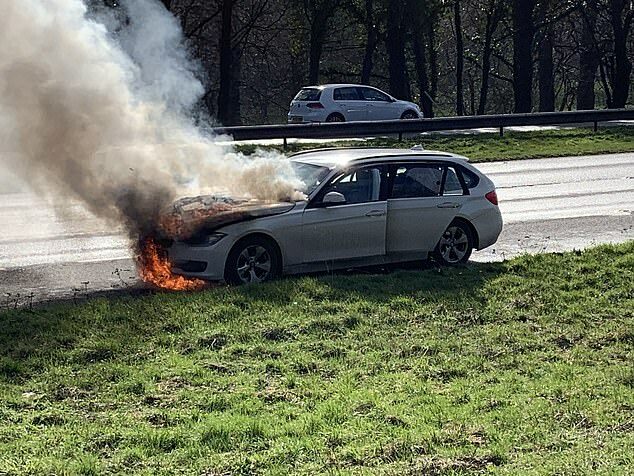 Minutes later, they watched from the side of the road as their BMW 3-Series – now the subject of a worldwide safety recall – was engulfed in flames. Mrs Longley said: ‘It was terrifying. The only thing on my mind when the car started smoking was the kids, and getting them out and away from the car. 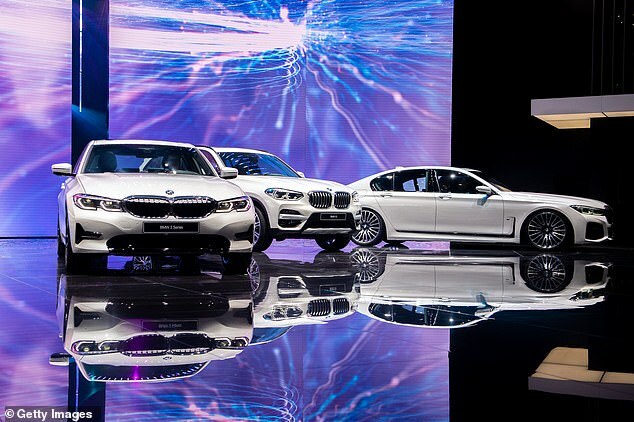 Around 1.6million BMWs around the world – including 268,000 in the UK – are affected by a potentially lethal fault with the exhaust cooler system near the engine. Earlier this month the Mail revealed thousands of owners had still not been told about the problem, which affects 12 models manufactured between August 2010 and August 2017. BMW began contacting drivers in October last year but the Longleys only received their safety recall letter on March 8. 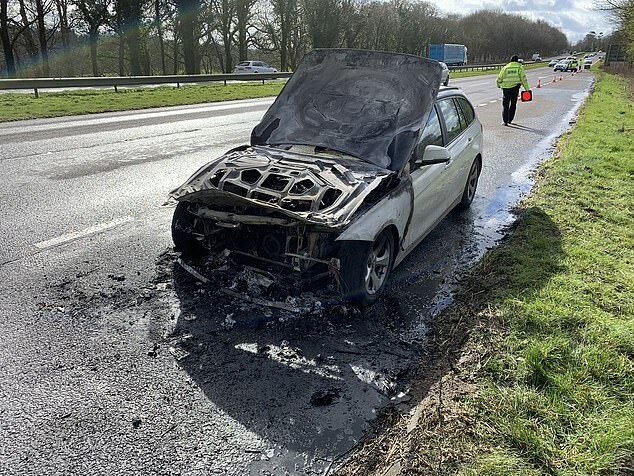 Just over a week later the car – a 2013 registration with a full service history at their local BMW garage in Stansted, Essex – burst into flames on the A1 as the family drove to visit relatives in Grantham, Lincolnshire. Mrs Longley, 34, who was driving, was using the cruise control system on the car in a 50mph average speed zone. When the vehicle started to slow down, Mrs Longley pressed on the accelerator but it did not respond. Seconds later smoke started to pour out of the engine and into the car through the air vents. The control panel also sounded an alert. The car, which was in the left-hand lane, then completely lost power and after getting to side of the road, Mrs Longley and her husband, who was in the passenger seat, leapt out in panic. 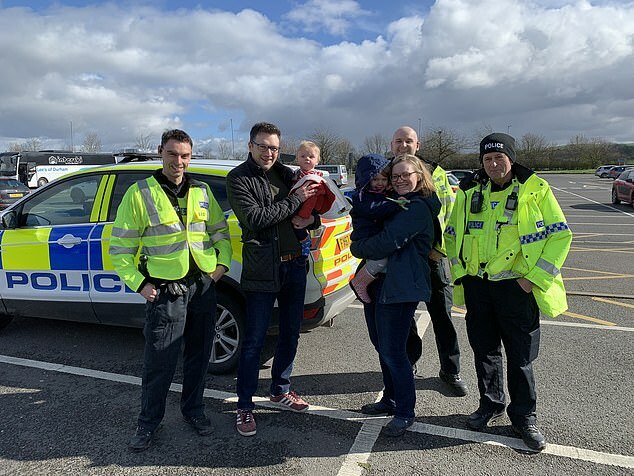 When the couple tried to open the back doors to rescue their children, Mrs Longley realised they were still child-locked and had to get back into the car to override the locks. Minutes after Adam and Eleanor were removed, the car was engulfed in flames. Two fire engines and police soon arrived to put out the flames. Mrs Longley, who works in PR, said: ‘We were lucky we were on a dual carriageway. I dread to think what would have happened if we had had to get two children out of the car and across a motorway. The Longleys wrote to BMW to complain and were furious when it initially described what happened as a ‘thermal incident’. The fault causes flammable coolant to leak from the exhaust gas recirculation cooler on to the hot exhaust system near the engine. Some drivers have had to wait weeks for an appointment, and then for up to two months for replacement parts because of the sheer number of cars involved. The vehicles affected by the recall include petrol and diesel models of the 1 Series, 2 Series, 3 Series, 4 Series, 5 Series, 6 Series and 7 Series, as well as the X1, X3, X4, X5 and X6 SUVs. The company added it had now contacted everyone affected by the recall and was reducing delays in tackling the issue. It said if a driver suspects their car has the fault they should call BMW emergency services on 0800 777 109.